The information helped me because: I have just received the reports and can't wait to learn everything! Other Comments: after browsing through the reports, I can see that this is a great value, as compared with similar info packages out there. This report covers everything you need to know in order to have a successful Internet presence using your Web site, and social media such as Facebook, Blog and You Tube videos to promote your teaching business. If you aren’t already online, this report shows you exactly how to get there. If you already have an Internet presence, this report shows you how to make yourself even more visible and profitable. Get to page one of Google every time if you follow this tip! Which keywords to use to sign up students? I tell you exactly which ones work. Register more Internet students no matter what your competitors are doing online. How to use Facebook to get your students to sign up their friends as students at your school. The one thing you must do to protect your domain name forever. How to make You Tube videos for a few dollars instead of thousands of them. Is Google Adwords necessary? Why it is and how to do it cheaply and effectively. Why twitter can help you offer better customer support. Is there an App for that? There may be and you need to know that! Are social media coupons good for your Business? Find out here! You can’t buy this report. It’s free when you order all of the other 3 reports! No mater what type of new business you start, if you can't develop an effective advertising campaign, you may as well not bother going into business. Customers won't come to you unless they know you exist. Getting your new business noticed is crucial to your future success. The first thing you need to know are the secrets to a successful advertising campaign. The information contained in this one report will dramatically increase the number of people who call you. If you currently are only able to sign 25 % of every customer who calls, by increasing the number of calls you get, you've already boosted your customer base even if nothing else changes! Here's a sample of what this report discusses. 200% increase in your ad response rate if you use this secret. Save up to 50% on your classified advertising. This secret alone saved me $150 each month. Stop wasting your money on useless ads. Secrets on where to advertise and where not to bother. Killer headlines that will dramatically get them calling you instead of your competition. Yellow pages? Why you need to be there even if you work part time and work alone. Yellow Pages? Secrets on how to make it cheaper than the classified! Yellow Pages? Secrets on how to get noticed in a busy section. 30 advertising secrets that made me tens of thousands of dollars. Ideas your competition never thought of. When to advertise and when not to. Do this and you'll save big! Secrets on how to get the best ad placement. This report shows you all the techniques and strategies I used to get the customer to come in and register for lessons. I was able to register over 75% of every person who calls or drops by from my ads. It took me 27 years to develop these strategies. No one else would dare reveal them to you. Why an unanswered phone can cost you plenty. 8 telephone tips that will secure you clients even if you don't answer when the customer first calls. How to answer the phone so you get the student, not lose them. How to make the student believe that you are the most qualified even if you're not. What 13 questions the student will want answered before they will sign up. The 13 answers to the 13 questions that will blast your enrollment through the roof. How to get some valuable references even if you're just starting your teaching career. How to use your existing and previousstudent base to get more students. How to take control of that critical first call and book that student. How to quickly increase your registration no matter what. 25 pages of tips and strategies to maximize your income opportunities as well as creating supplementary income streams related to teaching. Once you have registered the student, you must continue to market them if you're ever going to make some real money. If you can encourage each of your existing students to double the amount of money they are now spending with you, you have effectively doubled your student income without registering one more student! Teach smart and learn to maximize your profit. How to make $50 or more an hour teaching. I have made as much as $120/hr doing this. Working with others in your neighborhood for mutual profitability. Lesson products you never thought of that will make you lots of extra income. The secrets to upselling. How to get your students to spend more on lessons. Non Teaching revenue sources that students will spend money on. I've made over $50,000 from these. Creative ways for schools to cut your overhead. I'm saved $10,000 with just one of these ideas. How to set up a rental program for equipment your students need and would rather rent than buy. Rent to own? Worked for my students. This report shows you how. Where's the best place to set up shop? Your home? Your neighborhood? Downtown? I'll tell you. The more you pay out in business expenses, the less you earn. Save 15-25% just by reading this one report! Other Comments: every other book I saw on teaching dance deals with technique, these reports deal with the business of making money from teaching. Its just the sort of information I needed. 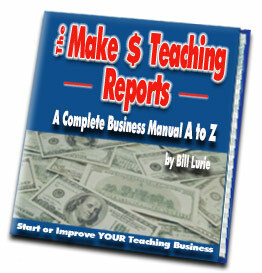 You can order each report for $5.95 or order all 3 reports plus two addition bonus reports, all for $9.95. 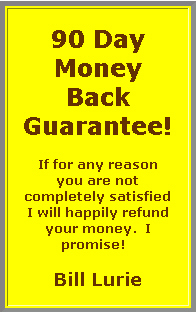 will refund your full purchase price. Sounds like a good deal to me. Honestly, instead of having to have been in business for 27 years before I wrote these reports, I wish I had had the opportunity of reading them first. I would have made lots more money, and saved myself from having to learn some very expensive lessons.